Small Iowa landfills began to close when the U.S. Environmental Protection Agency and the Iowa Department of Natural Resources began requiring stricter regulations and permits for landfills in the 1990's. Some communities consolidated their waste services to regional or multi-county landfills such as the Dubuque Metropolitan Area Solid Waste Agency, shown in this October 2018 photo. “See that brown building, to the left of the tree line? That’s the University of Dubuque. And a little further left, you can kind of see that little ridge, you can see it better some days, that’s the Platteville ‘M,’” John Foster, administrator for the Dubuque Metropolitan Area Regional Landfill, said, referencing the Wisconsin border-town’s landmark: a large white M on the side of a mound, by the Mississippi river. Foster was standing in Dubuque at the top of a closed landfill cell, one of nine cells the landfill has planned for the more than 600 acres around him — enough to last the Dubuque area in eastern Iowa through the century. 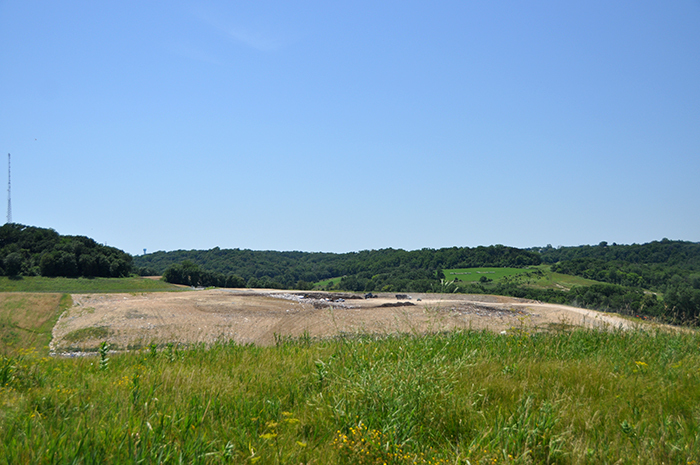 Dubuque’s active landfill cell, one of nine the landfill has planned to manage waste in the Dubuque area. 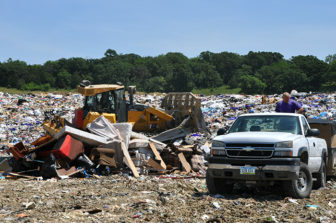 But smaller landfills in Iowa have not fared as well as Dubuque’s the last 24 years, since the U.S. Environmental Protection Agency created federal rules on issuing permits that municipal landfills have to follow. Many small Iowa communities no longer could afford to maintain their local dumps when faced with increasing regulation and permitting fees by the EPA and Iowa Department of Natural Resources. For example, landfills pay flat permit fees to the state for things such as processing tires or household hazardous materials, recycling facilities and composting, regardless of the size of the facility or amount of waste it collects. The EPA recorded 77 municipal landfills in Iowa in 1996. A little less than half of them — 35 — have closed to accepting new trash, although 14 continued to provide collection services to their communities as transfer stations. As a result, regions throughout Iowa have consolidated their landfills and solid waste services, closing many small-community landfills and converting some to transfer stations. In 2000, the DNR reported 2.8 million tons of waste from 75 facilities — 69 of them the municipal landfills that provide regular community garbage disposal. In 2017, DNR reports showed that Iowa landfills took in a little more than 3 million tons of trash at 49 facilities. 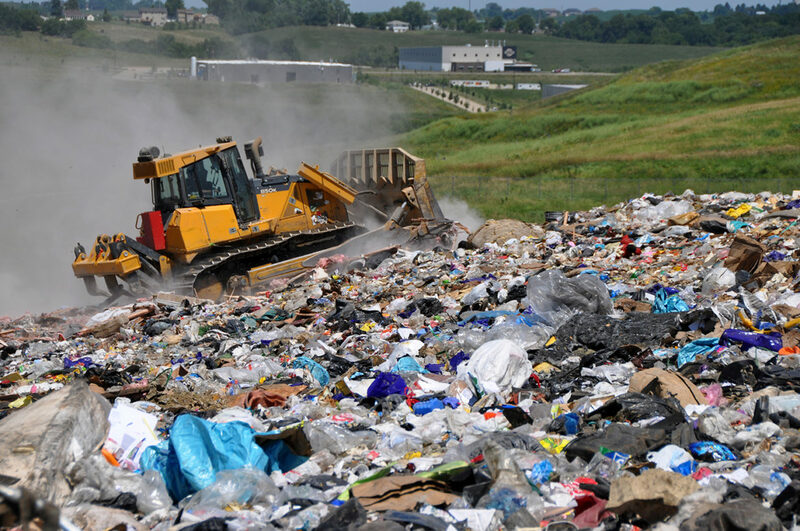 Of these landfills, 39 are public landfills, three are private landfills, and the others are construction and industrial landfills or specialized waste, such as ash landfills. DNR records show that 2.94 million tons were dumped in 42 municipal landfills in 2017, up a little more than 832,000 tons from the 2.19 million dumped in municipal landfills in 1994, when the EPA federal rules for municipal landfills were established. The garbage dumped in 2000 was the highest recorded by the DNR until 2017, although a little more than 2.8 million tons also was landfilled in 2011 and 2012. The lowest amount since 2000 was almost 2.6 million tons in 2003. In 1993, the U.S. Environmental Protection Agency established rules, known in the industry as Subtitle D, for municipal landfills that required landfills to be permitted with the state. Although some areas at the time already had started organizing and consolidating their solid waste services, there still were areas operating with a town dump — possibly more than 100, Smith said. Landfills of a certain size in Iowa are required to dispose of greenhouse gases such as methane created by the decomposing waste. 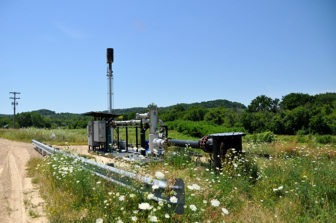 The Dubuque landfill uses a torch to burn the methane, and hopes to begin using the methane to generate electricity. 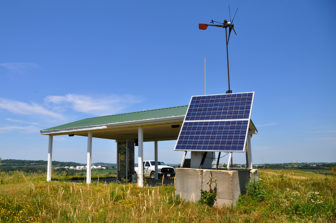 Iowa established further regulations, including the Clean Air Act in 1996 that required landfills of a certain size destroy the methane gas the landfills produce, Smith said. In 2007, Iowa passed the Groundwater Protection Systems law that required landfills to install a liner system beneath their waste, to prevent leachate from seeping and contaminating groundwater. Many landfills could not afford the cost of installing the proper liner to comply with the new regulations, Smith said. Between 2007 and 2012, these 11 municipal landfills in Iowa stopped collecting waste: Ida County Sanitary Landfill, Hamilton County Sanitary Landfill, Crawford County Solid Waste Agency, City of Sioux City Sanitary Landfill, Fayette County Sanitary Landfill, Clarke County Sanitary Landfill, Woodbury County Sanitary Landfill, Grundy County Sanitary Landfill, Audubon County Landfill, Bremer County Sanitary Landfill and Jones County Sanitary Landfill. “When you look back over time, you see small community landfills have gone to more of a county landfill, and county landfills have gone more to multi-county landfills, and that’s really the step that we’re at right now,” Foster said, of the Dubuque landfill. The Dubuque Metropolitan Area Regional Solid Waste Agency has expanded to offer services in all of Dubuque County and nearby Delaware County. Transportation costs can be expensive when a landfill is not near so some of the former, smaller ones were switched to transfer stations. A transfer station cuts costs by providing pick-up and collection services to communities and temporarily holding the waste. Some of the former municipal landfills that began operating as transfer stations after 2007 include: Rathbun Area Solid Waste Commission Transfer Station, Kossuth County Transfer Station, Montgomery County Transfer Station, Union County Transfer Station, Adair County Transfer Station and Buena Vista County Transfer Station. 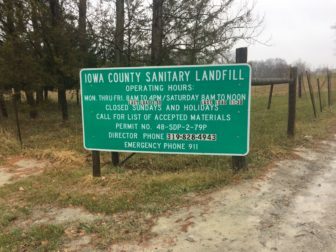 Smaller landfills, such as Iowa County Sanitary Landfill near Homestead, are challenged with balancing their funding between tipping fees and taxes, while maintaining and updating their sometimes outdated resources and equipment. Entrance to the Iowa County Sanitary Landfill. Photo taken Dec. 1, 2018. The Department of Natural Resources reported the Iowa County Landfill collected 11,154.32 tons of trash in 2017, one-twelfth of the 134,326.24 tons collected by the Dubuque Metropolitan Sanitary Landfill in 2017. Responding to current landfill demands takes baby steps John Gahring, of the Iowa County Landfill, said. “We kind of went from an old country landfill trying to come into the modern day,” he said. The landfill, formally known as the Regional Environmental Improvement Commission of Iowa County, operates under a 28E agreement, which allows for joint exercise of governmental powers, allowing each city in the county to be involved in the operation. It is run by a board of five county representatives and a representative from each city in the county. Gahring serves as board chairman. Gahring said the board is considering raising the landfill’s tipping fees. The goal is not over-taxing citizens and customers but also keeping the landfill affordable. Meeting that challenge is a constant battle. “I think that’s what we constantly battle with is trying to keep everything in an even balance, so that we don’t have, you know, we aren’t starting to find TVs in the ditch and tires in the ditches and things like that because it’s too high just to bring it over to the landfill,” Gahring said. An audit report for the landfill’s income and expenditures showed that, while tipping fees accounted for 70 percent of the landfill’s income in both 2016 and 2017, the landfill collected $34,220 less in 2017 than in the previous year. Additionally, the cost of operating the landfill increased by $170,535 from 2016 to 2017. The two largest increases included more than $122,000 for the purchase of a compactor, equipment rental and repair costs; and an increase in legal fees by almost $39,000. 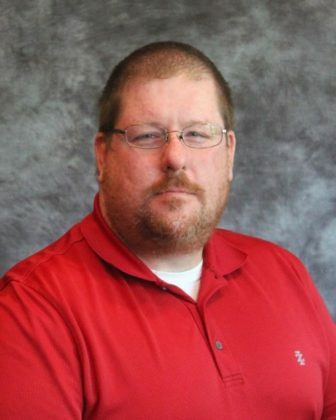 Included in the legal fees, the landfill and Iowa County are being sued by the former director of the Regional Environmental Improvement Commission of Iowa County, Richard Heller, for what Heller says was wrongful discharge and retaliation, among other charges. Iowa County hired a private investigation agency to review Heller’s job performance. The report showed that Heller deleted public emails and documents and failed to properly and safely maintain public property and equipment at the landfill. U.S. District Court sent the case to state court, and the case was back to Iowa County District Court in August. Heller dismissed a Family and Medical Leave Act claim in October but remaining legal items in the lawsuit are awaiting trial. Maintenance and repair is constant. For example, the county landfill commission had to install new vents in the landfill to bring it up to Department of Natural Resources standards and buy neighboring property that had been damaged by seepage from leachate. Leachate is a common problem in older landfills, Gahring said. The upside of diverting more material, in spite of reduced income from tipping fees, means that fewer materials go into the landfill, and costs for operating, maintenance and repairs are down, Gahring said. New revenue opportunities exist, Gahring said. The landfill recently needed to clear trees off a new landfill cell. Instead of paying someone to do it, or doing it with the landfill’s resources, the commission sold the trees to someone willing to come in and harvest the trees. Gahring said the county has no plans to expand trash collection beyond Iowa County. Iowa landfills, including the Dubuque Metropolitan Area Solid Waste Agency, took in more than 3 million tons of waste in 2017, some of it from other states. The Commerce Clause of the U.S. Constitution can prevent states from regulating interstate commerce including, in some instances, establishing regulations that would prevent waste imports and exports. This precedent has been set by supreme court cases such as Philadelphia v. New Jersey in 1976, when a New Jersey law that prevented waste from being brought into the state was struck down for being unconstitutionally discriminatory against interstate commerce. Smith said this also prevents states from regulating tipping fees to discourage communities from taking their waste out-of-state if doing so would be more economical. 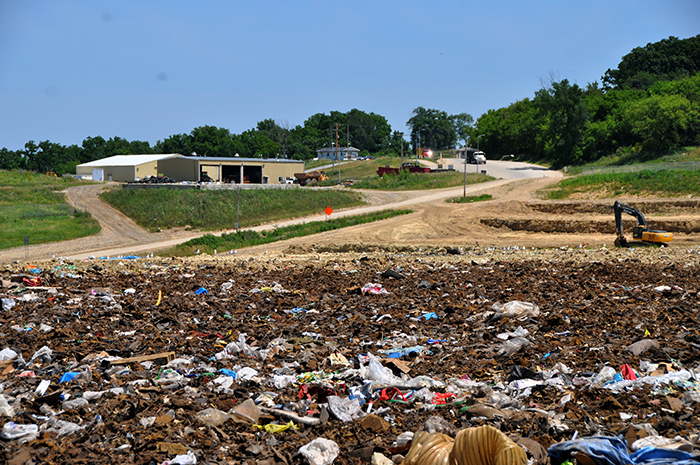 Since establishing regulations for municipal landfills, Iowa has used comprehensive planning to ensure that solid waste services are available to all communities and to prevent communities from competing with each other for landfill business. A community may send waste to another state if doing so is less expensive, even though it cannot take the waste to somewhere else in Iowa that is outside its comprehensive planning area. Conversely, when no more neighboring regions can or will consolidate, landfills looking to expand their tonnages can look out of state for contracts. According to the Department of Natural Resource’s tonnage reports, 26 percent of the waste taken in by the Dubuque Metropolitan Area Regional Landfill in 2017 was from out of state, largely Wisconsin. One advantage for Dubuque when it goes out of state for these contracts is that the city can charge garbage haulers tipping fees for dumping garbage in the Iowa facility but do not have to pay operating costs, such as dump truck purchases or garbage and recycling bins. Out-of-state waste accounted for 6.6 percent of the trash entering Iowa landfills in 2017. Loess Hill Regional Sanitary Landfill, a private landfill in Malvern, brought in the most out-of-state waste, with 39 percent coming from Missouri and Nebraska. Dickinson County Landfill, with 27 percent of its waste imported from Minnesota, was the only landfill taking in more out-of-state waste than the Dubuque landfill. The Department of Natural Resources did not have estimates for waste exported out of Iowa for 2016 and 2017. While western Iowa experienced a significant number of landfill closures between 2008 and 2012, two of the state’s three privately owned landfills, Loess Hills Regional Sanitary Landfill and Dickinson Sanitary Landfill Inc in Spirit Lake, emerged as landfilling the most tons of waste in the area. Central Disposal Landfill in Lake Mills, Dickinson Sanitary Landfill and Loess Hills Regional Sanitary Landfill are Iowa’s only three privately owned municipal landfills. Dickinson Sanitary Landfill and Central Disposal Systems are owned by Waste Management. Representatives from Waste Management and the Loess Hills Regional Sanitary Landfill declined to respond to IowaWatch’s interview requests for this story. Northeastern Iowa also experienced a series of landfill closures before 2012, while landfills in some of the state’s most populous cities in the area continued to increase their tonnages. Those increasing intake include Cedar Rapids Linn County Solid Waste Agency in Cedar Rapids, Black Hawk County Sanitary Landfill in Waterloo and Dubuque Metropolitan Solid Waste agency. Like Dubuque Metropolitan Solid Waste Agency, Cedar Rapids Linn County Solid Waste Agency does not receive tax money for regulatory programs mandated by the state, such as curbside recycling, yard waste, appliances recycling, and tire recycling. It relies on tipping fees for its funding. “There are private landfills out there, they’re trying to fit as much solid waste into their space as they can to turn a profit. That is not our mission,” Joe Horaney, communication specialist with the solid waste agency, said. Horaney said the landfill’s focus, instead, is on managing waste in a safe and sustainable way. So far, the landfill has not faced funding challenges in doing so, he said. It’s a market-driven business, however, Horaney said, which means services the landfill offers change. Shingles, for example, used to be accepted for a fee, but the landfill quit doing that when low oil prices made it no longer economical to hire vendors who accepted and processed the shingles. The landfill, which has a 25-year-life expectancy, operates under a 28E agreement and serves all of Linn County. Horaney said he does not see the landfill expanding beyond the area. Southeast Iowa has not experience as many landfill closures as other areas of the state, and Metro Park East — owned by Metro Waste Authority in central Iowa’s Polk County near Mitchellville — is the state’s largest landfill, collecting more than 667 tons in 2017. The second highest tonnage in the southeast region in 2017 was Scott County Sanitary Landfill, at 177.7 tons, and Iowa City Sanitary Landfill, at 136.6 tons. Metro Waste Authority provides trash services to Dallas County and Polk County, and operates Metro Park West — formerly the North Dallas County Sanitary Landfill — in Perry, Metro Central Transfer Station in Des Moines, Metro Northeast Transfer Station in Grimes and Metro Park East in Mitchellville. Additionally, Metro Waste Authority operates a hazardous waste facility and a compost facility. Leslie Irlbeck, public affairs manager for Metro Waste Authority, said the agency formed in 1969. The operation was the first 28E agreement in Iowa, and has a representative on their board from each of the 17 communities it serves, as well as Polk County representatives. Metro Waste Authority is funded directly by the services it offers. “As a government agency, Metro Waste Authority sees our role in managing waste to make sure that the programs and services are available for residents and businesses who need to dispose of things,” Irlbeck said. For example, a local private construction and demolition recycling facility recently went out of business, so Metro Waste Authority began offering these services to ensure that they still were available in the area. Now, the Metro Waste Authority is the only construction and demolition recycling services provider between Denver and Chicago, Irlbeck said. Central Iowa has experienced growth in recent years, both in population and, as a result, in businesses, Irlbeck said. While the landfill continues to expand its material diversion programs, such as compost or recycling facilities, the amount of waste being landfilled continues to grow. Landfill operators are not concerned with running out of space, Irlbeck said. Metro Waste Authority officials try to improve their operations by studying other facilities and talking with other agencies. Recently they changed the way they layer and compact the garbage before putting it in a landfill after learning about a more efficient way from touring another facility. “We are always looking to what’s ahead. The second I think we become defined by the way garbage has always handled is the time that we become irrelevant,” Irlbeck said. Iowa County landfill operators say they hope to begin taking in shingles for recycling and brush for composting. This pavilion, with an educational map of the landfill and planning area, is on a closed landfill cell at the Dubuque Metropolitan Area Regional Landfill and was funded through the EMS program. In addition to Iowa County’s, other landfills, transfer stations and solid waste agencies participating in the program are: Cass County Environmental Control Agency, Cedar Rapids Linn County Solid Waste Agency, Dubuque Metropolitan Area Solid Waste Agency, Great River Regional Waste Authority, Iowa City Landfill & Recycling Center, Landfill of North Iowa, Metro Waste Authority, Northern Plains Regional Planning Area and the City of Spencer Landfill, Ottumwa/Wapello County Solid Waste Commission, Rathbun Area Solid Waste Management Commission, South Central Iowa Solid Waste Agency, Waste Commission of Scott County and West Central Iowa Solid Waste Management Association. Success with a traditional attitude toward waste diversion is achieved by the amount, or weight of waste diverted from a landfill so the focus becomes looking at diverting the heaviest materials. With EMS, landfill operators look instead for items that have the most negative impact on the environment, Irlbeck said. Household hazardous waste such as mercury, for example is not heavy but is a toxic substance and dangerous for a landfill, Irlbeck said. “Environmental management systems is a much more holistic way of viewing the way that our agency conducts business and the impact that we have on the environment,” she said. Dubuque was a pilot member of the EMS program. The landfill has a closed cell, now covered with grass, and a pavilion with educational information about the landfill that was an early project through the program. This IowaWatch story was republished by The Des Moines Register, Fairfield Ledger, The Courier (Waterloo-Cedar Falls, IA) and Midwest Center for Investigative Reporting under IowaWatch’s mission of sharing stories with media partners.